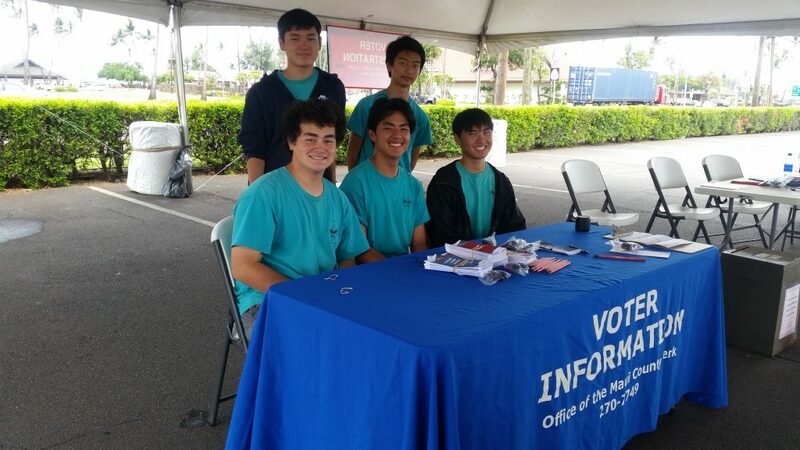 Volunteers manning the Drive-Thru Voter Registration event in Kahului. PC: by Wendy Osher 7.12.18. 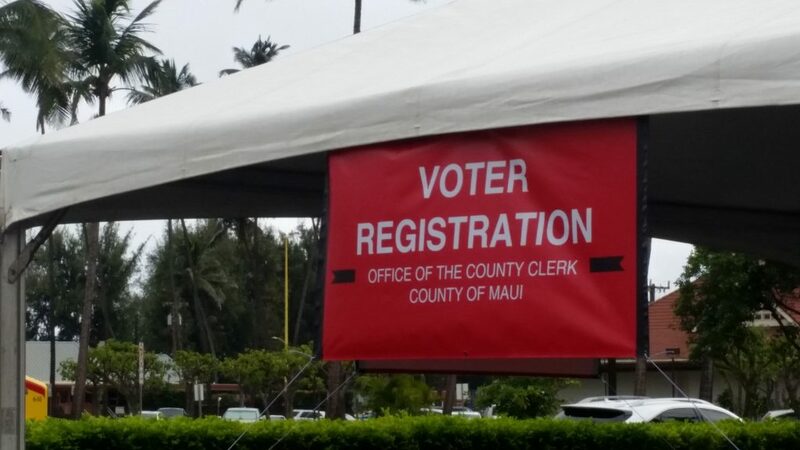 The Office of Elections and County Clerks is conducting drive-thru voter registration on Maui today, July 12, from 8 a.m. to 4:30 p.m. at the Kahului Shopping Center. Election officials are on hand to assist voters in registering from the convenience of their vehicle. Voters who have moved or changed their name since the last election will need to update their registration. Additionally, voters are welcomed to drop-off completed voter registration forms to the following locations across the state. 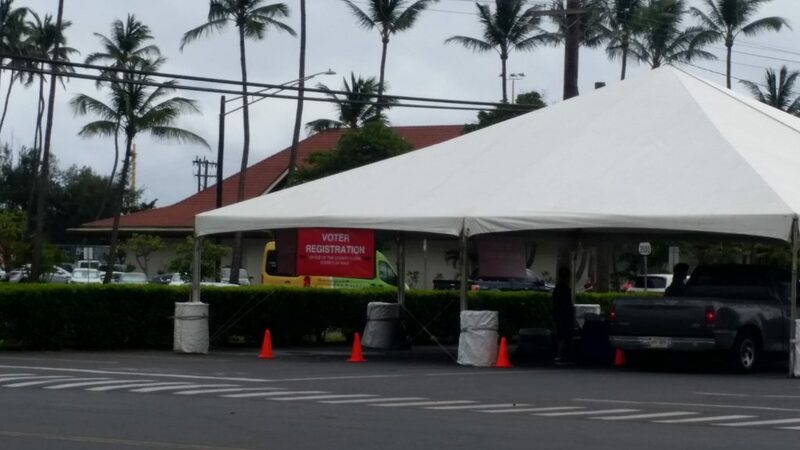 Drive-Thru Voter Registration event in Kahului. PC: by Wendy Osher 7.12.18. 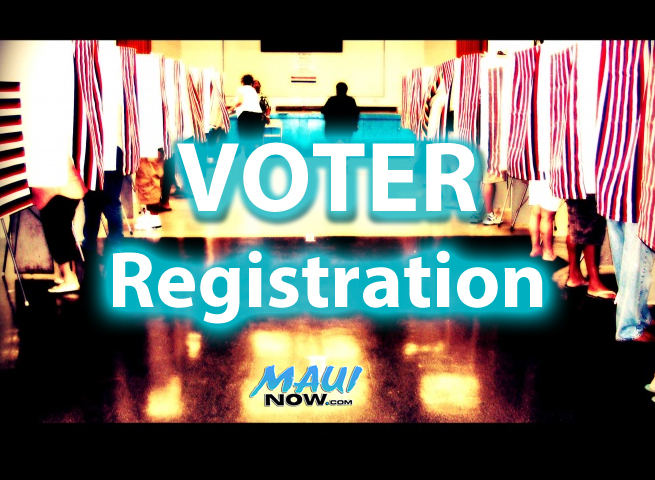 To be eligible to register to vote, you must be a US Citizen, a Hawaiʻi resident and at least 18 years of age. 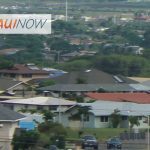 Hawaiʻi law allows for voter pre-registration at 16 years of age, however the individual must be 18 years of age to vote. Voters can also register online, by mail, or at the Clerk’s Office by July 12. Applications must be submitted by 4:30 p.m. to register to vote in the Primary Election. Mailed applications will be accepted if postmarked by July 12. Additionally, voters registered by July 12 are eligible to request a mail ballot. Individuals who miss the July 12 deadline can still register and vote at an Early Walk in Voting site within their county from July 30 to August 9 and beginning with the 2018 Primary Election, qualified individuals may register and vote at their assigned polling place on Election Day; however, they may experience increased wait times at the polls as they will be required to complete a Registration Affidavit and confirm they are at the correct polling place. These extra steps ensure the integrity of the voter registration rolls and the election. The Primary Election is on Saturday, Aug. 11, 2018. Polls are open from 7 a.m. to 6 p.m. For additional information on the 2018 Elections, visit elections.hawaii.gov or call (808) 453-VOTE (8683).